At Great Southern Bank, we believe in volunteerism and the impact it has on the overall health of our communities. Our associate's actions reflect our Company's charitable spirit. Our bankers are more than just bankers. They are mentors, spending their lunch hour tutoring second graders; they are board members, offering their leadership and experience to local nonprofit organizations; they are advisors, attending Chamber meetings working to bring more jobs to their town; they are educators, offering tips to seniors of how to safe guard their hard-earned money. We are proud of our associates and support their efforts to strengthen our communities, making them better places to live, work and do business. Great Southern Bank’s annual Bill and Ann Turner Distinguished Community Service Award was created to emphasize the importance placed on volunteerism at Great Southern Bank by honoring one outstanding associate who demonstrates excellence in volunteer service to their community. Associates throughout the Company have the opportunity to nominate coworkers they believe are worthy of this honor. A committee comprised of community leaders review the nominations and select an annual recipient. On the winner’s behalf, Great Southern Bank donates $1,500 to their charity of choice. A true leader in his community with a sincere passion to help those around him succeed, Eric’s strong commitment to empower individuals and families in poverty to be self-sufficient embodies the spirit of our Community Matters Program and the integrity of this award. In honor of Eric's outstanding volunteer service, Great Southern Bank has made a donation to Upsilon Omega Foundation and Pathways to Progress, an initiative of Catholic Charities of St. Louis. 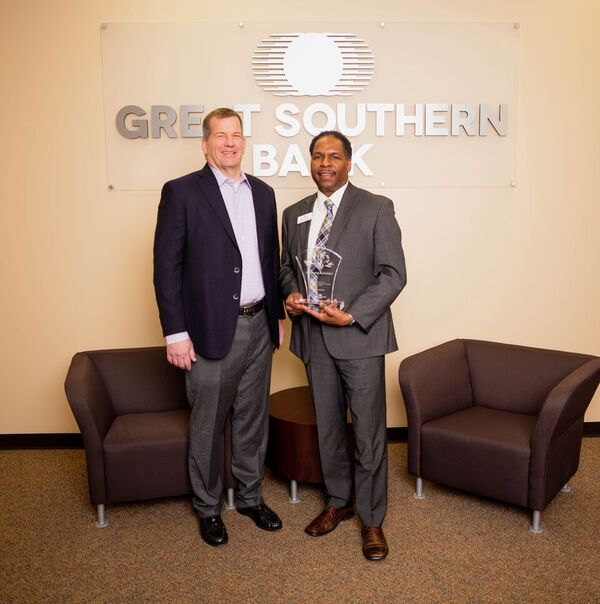 Pictured from left to right: Joe Turner, President and CEO of Great Southern Bank; Eric Mitchell, 2019 Award Recipient and Retail Banking Regional Manager for Great Southern Bank. We asked some community leaders to describe to us the effects Bill and Ann Turner have had on shaping the culture of volunteerism at Great Southern Bank and in our communities. Listen to our 2019 award recipient, Eric Mitchell, describe his community, the organizations he's involved with and the importance of volunteering.